Ripshift Managing Director Phonsy Mullan said "It's great to be involved in the category, racers have embraced the Ripshift and are keen to fit our Ripshift into their utes". 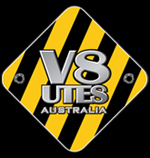 Spectator's can expect to see the Ripshift livery on V8 Utes at each round of the V8 Ute Series aswell as on television screenings of the V8 Ute Rounds. Never miss 3rd gear again!